I prepared a double batch of the Black Bean and Butternut Squash Chili this past weekend. I have made quite a few Vegan chilis in my lifetime, and they are usually quite delicious. This one did not disappoint, and it had the advantage of being very quick and easy, especially if you purchase the butternut squash already peeled and cut. Many people find it daunting to deal with a whole raw butternut squash. They will either buy peeled and cut squash, which tends to be very expensive, or opt out of a recipe entirely. I chose to use a technique I have come to love for peeling and cutting butternut squash. It involves a microwave oven, so for you purists out there, cover your eyes quick! But I get the benefits of cheaper and much fresher butternut squash cubes. And I also get to keep my digits intact. 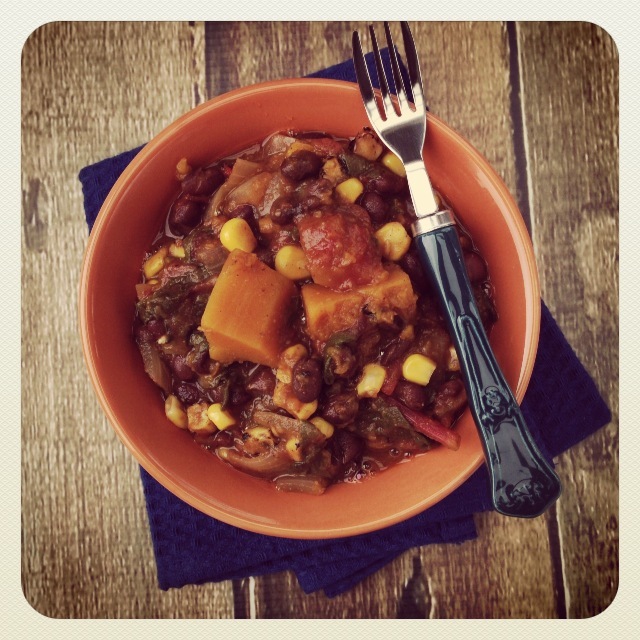 Related Post "The Eat to Live Cookbook: Black Bean and Butternut Squash Chili"
So, what’s Healthy World Cafe all about?